After shopping for a fountain and only finding one I liked for $499, I decided to take a trip to Harbor Freight and spend $12 to purchase a pump to DIY a fountain with items I already had at home. 1. Dig a hole, put a black liner in it (I use a barrel liner or stock feed container). 2. Level the liner! A leaning pot=water running down only one side of the pot and frustration when you have to tear everything back apart to fix it. 3. Drill 1/2" hole in bottom of a pot (or a hole the size of the tubing needed for your pump). 5. Run the tubing up through the hole, attach tubing to your pump & plug it in. It has to fit snugly into the hole, or you will need to seal it with silicone (you may want to anyway). 6. Use rocks to cover up the edge of your black liner, or let it show and plant right up to the liner, once the plants fill in the liner will not show. I'd recommend rigging up a tray to the top of your pot if it is large, water weighs a lot. You could also add a small fountain at the top, but I like subtle things, so I do not. Now you've got an effective water feature for ~$60.....even less if you find things you already have to use. I've created variants of DIY fountains enough times that I can put one of these together in a few hours. If you have never tried it, plan on making a day of it. Oh...and plug it into a GFCI outlet please. I like that very much. And to think of all the money you saved. We have a Harbor Freight store. Maybe I need to check it out. Great job on your fountain. You've picked just the right combination of plants and rocks to make your fountain even more special. It's been well worth the effort to create such a lovely feature in your garden. Very lovely result. You are so good! Thank you for sharing it. That is a wonderful project, Pianolady. 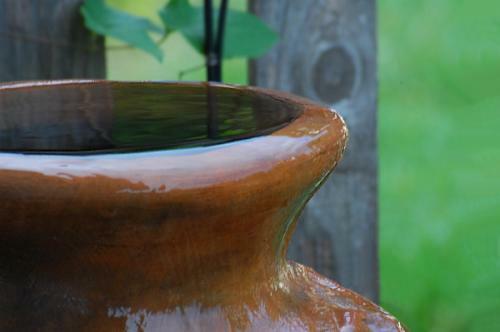 Water features add so much to a garden and yours is a beauty. Love your creative diy fountain. That has inspired me to go ahead and use a big favorite pot for my own garden. Oh what fun....the water feature is wonderful!